Demi Moore went on a mission at the end of 2013 to get rid of everything in her life that reminded her of her ex-husband, Ashton Kutcher. As part of her post-divorce cleansing, the 51-year-old single mother celeb sold her emerald cut, five-carat diamond engagement ring for an astounding $250,000. Moore is definitely not alone. 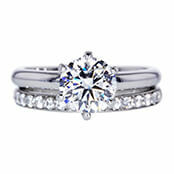 Many women have decided to sell their diamond rings for both emotional and financial reasons. 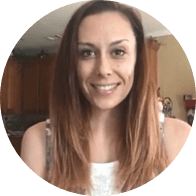 Getting rid of the most tangible symbol of an ended relationship can do wonders for a woman who is looking to move on. What's more, the cash return for a diamond ring can ease a woman's new financial predicament of having to deal with more expenses on her own. To help guide women on how to resell their diamond rings online after divorce, we've put together a useful "How to Sell My Diamond Ring FAQ" page. It's an essential resource for anyone who is interested in selling their diamond ring quickly and making a great profit. What Should I do Before I Sell My Diamond Ring? The first thing you should do is clean your diamond ring so it sparkles. First impressions are super important, so shine that rock before you flaunt it. 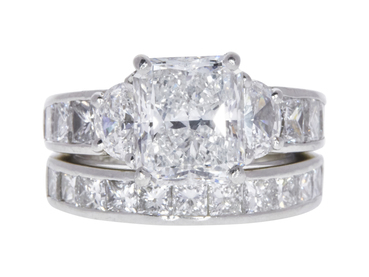 Next, you should make sure you know your diamond's cut, clarity, color, and carat, commonly known as “the 4 C’s”. These characteristics are what determine the value of your diamond. Carat refers to the diamond's size. The larger the diamond, the greater the carat weight and value. Regarding color, most diamonds have tinges of yellow or brown. Diamonds that are determined to be completely colorless have a higher value. As for clarity, diamond buyers check for a lack of flaws and scratches on the gem. The fewer the flaws the diamond has, the higher its value will be. And let's not forget the cut, which is often confused with the diamond shapes: Round, Oval, Princess, Marquise, Pear, Cushion, Emerald, Asscher, Radiant, and Heart. But the cut grade refers to the proportions, symmetry, and polish of a diamond. The cut ultimately affects how the diamond will interact with light. 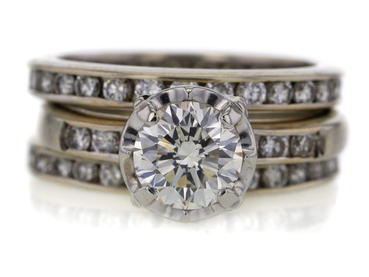 Diamond grading reports are the most accurate way to learn a diamond ring's attributes. These reports are issued by gemological labs that use state-of-the-art tools to evaluate precious stones. At Worthy, we trust GIA and GSI, the world's top gemological labs, to grade every diamond ring that is sent to us. What Should I Know About the Setting? It's also important to know the quality of the gold that makes up the setting of your diamond ring. Look around the house for a magnifying glass and examine your gold jewelry for a stamped marking that states the karat amount. This amount represents the pure gold present in your ring. If your diamond ring has '10K' stamped on it, it is 41.7% pure gold. If your item has '12K' stamped on it, then it is 50% pure gold. If it has '14K' stamped on it then it is 58.3% pure gold and an '18K' stamp means it's three-quarters pure gold. What's the Fastest Way to Sell My Diamond Ring? Selling your diamond ring on your own can be very a prolonged and complicated task. Ecommerce platforms like Amazon can be successful methods, but only if you have previous experience with selling diamond rings. One of the main advantages of selling your diamond ring through a network like Worthy is the time you save. If you want to resell your diamond ring quickly without a headache, then our community of buyers is the perfect option for you. 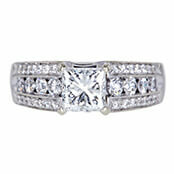 In no time, you'll gain access to some of the highest potential proposals for your diamond ring. Plus, Worthy manages the whole selling process for you, from A to Z. All you have to do is ship your diamond ring by a FedEx courier free of charge and fully insured to Worthy and we'll take care of the rest, right up to delivery of your diamond ring to the selected buyer. We'll handle the final sale and you will get your money within just 24 hours. 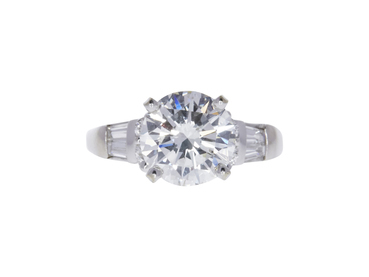 How Do I Choose a Trusted Buyer When I Sell My Diamond Ring? 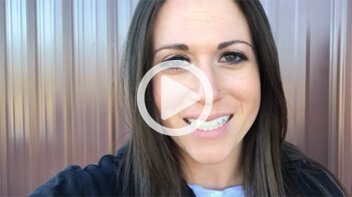 When you resell your diamond ring, it's essential that you feel 100% confident with who you choose to work with. Making sure that your choice has a good Better Business Bureau (BBB) rating is the right place to start. 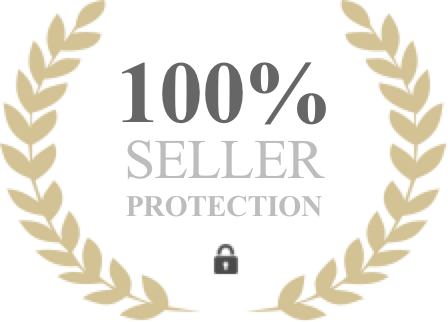 For example, Worthy has a superb BBB rating and it holds a precious metal dealer certificate issued by the Office of Consumer Credit Commissioner of Texas. So, by selling your diamond right via the Worthy network, you can feel confident that you are putting your valuable in safe, experienced hands. 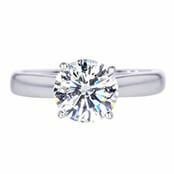 We invite you to read our customer reviews and learn just how easy getting top dollar for your diamond ring can be.